As you can tell the procedures below have been done in my kitchen, as most of the Simple Saturday posts will be. Color mixing is easy, simple, and fun to do...just wait and see. Here are the three glasses half filled with colored water. 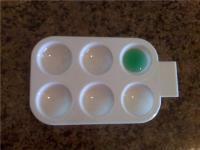 I used 5 drops of each shade of food coloring in each glass. You might want to experiment with the concentration of color you'd like to use. It has been my experience that if you make the color solution too dark it doesn't work as well and your child's fingertips might get a bit stained (But who cares...right?). 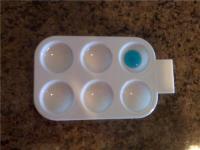 I filled the eyedropper with a nice blob of blue and then dropped it into the first space in the color mixing tray. Let's get crazy now. How do you think I was able to make purple, huh? Or how about that orange right there? What colors must combine to make this happen? I wonder how pink is made. Or brown. Or black. I encourage you to ask the questions and let your young child figure out the color combinations on their own. So what if the shade isn't right. Simply wipe it out and begin again! Get Ready. Tomorrow is Simple Saturday. I have made a career out of having a great time with kids utililizing very simple things. In fact, most of the items needed to create a fun little activity can be found right there in your kitchen. Cheap fun. Simple quality time with your kids, hence the theme of my blog, Simple Saturdays. Here's the plan: On Friday I will give you a list of items that you might like to gather. On Saturday I'll show you what to do. There will be activities for all aged kids, wee ones to those that tower over us. Games, crafts, pastimes, things that help to develop motor skills and lengthen the concentration span. Laying-on-your-back-gazing-at-the-clouds type of things. Sounds like fun to you? It does to me. The supplies needed for Simple Saturday are an eyedropper, a color mixing tray (I bought this one at Jo Ann's for about $1.25), red, yellow, and blue food coloring, water, and 3 small glasses (baby food jars work great!). It might be good to have a sponge nearby. That's it! I'll see you tomorrow!